Elegant, enigmatic Jay Gatsby yearns for his old love, the beautiful Daisy. But she is married to the insensitive if hugely successful Tom Buchanan, who won't let her go despite having a mistress himself. In their wealthy haven, these beguiling lives are brought together by the innocent and entranced narrator, Nick - until their decadent deceits spill into violence and tragedy. 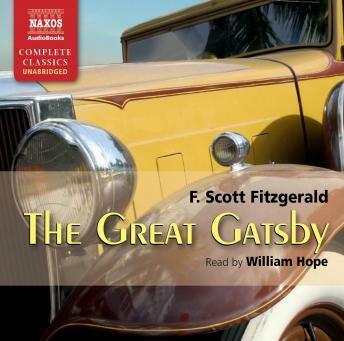 Part morality tale, part fairy tale, The Great Gatsby is the consummate novel of the Jazz Age. Its tenderness and poetry make it one of the great works of the 20th century. One of the great 20thc novels. The reader is taken into a strange, sad but wholly believable world. Such a classic, lovely to visit it again. You can feel the time in which it was written seeping through. This book was awesome. I really liked it. Narrator was fantastic.